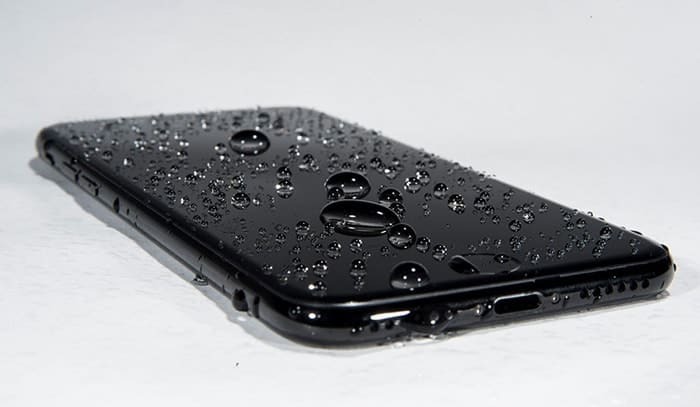 The iPhone 7 and iPhone 7 Plus are Apple’s first IP67 certified water resistant smartphones. So, many of you might have already decided to put the certification to test. Whether taking the iPhone along for a bath, or accidentally dropping it in the swimming pool, the phone might have already taken quite a few significant dips. Sure, it’s water resistant and will likely survive the deepest possible dives. But there’s always the possibility of water droplets getting trapped in the speaker mesh. Reddit user PointlessPankcake shares a similar experience where he went into the shower with his iPhone, accidentally dropped it on the floor and got water into the speaker grill. This caused sounds coming out of the speaker to be dampened. His first intention was to try rubbing alcohol in the speaker in order to evaporate the trapped water. But it turned out that the speaker mesh is designed not to let liquids in, so that didn’t work! Ultimately, he came up with a commendable idea. The smart trick involves using sound waves to push the water out. Playing sounds at a particular frequency can force the water droplets out of the speaker grill, allowing the sound coming out of them to be distinct again. This technique has already been used in Apple Watch Series 2, where the Watch plays a tone at a specific frequency to throw out the water from the speaker. But how do you get this trick to work on the iPhone? There are a number of apps available on the App Store that could be used to emit sounds of various frequencies. Sonic is one such app worth mentioning. Sonic can generate sine wave tones from 0 Hz all the way up to 25 kHz frequencies. The app gives you control over the frequency of emitted sound, which can be changed by swiping up or down on the screen. >>Get Sonic from the App Store. You might have to vary the frequency a bit in order to find the right one that would push the trapped water droplets out of the speaker mesh; the user reports that it should be close to 165 Hz. As the droplets start coming out, you may use a piece of absorbent material to dab them up. If you liked this handy little trick, or have something else to add to it, do let us know in the comments below.